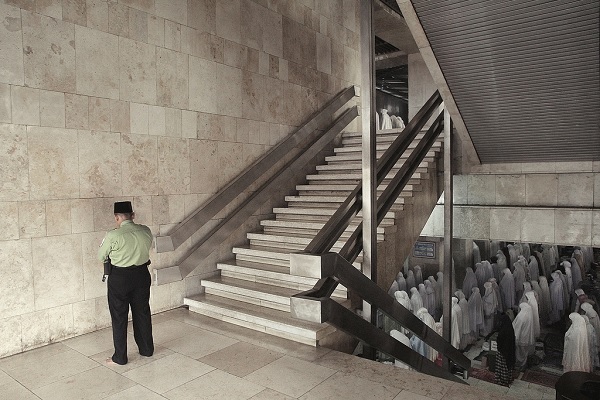 A guard prays with others at a mosque. How do you celebrate the presence of a loving, divine protector while guarding against crime in your church, synagogue or mosque? Not always very well, according to research measuring the extent and nature of crimes against congregations, and the ways congregations address security concerns. In a national survey of more than 1,300 congregations, nearly 40 percent reported they had experienced a criminal act in the past year. Yet congregations appear to underestimate their risks for future crimes, West Virginia University sociologist Christopher Scheitle found. So, while 19 percent of congregations reported having the outside of their building vandalized in the past year, and 16 percent reported a theft inside their building, just 9 percent said it was very likely they would be victims of a property crime in the next year. And just 2 percent reported that “any violent crime” was highly likely to happen, although 4 percent of congregations had recently experienced an assault on their property. Overall, just a little more than four in 10 congregations had an alarm system, and about one in five had security cameras. Just 1 percent reported having a full-time security guard. This ambivalence centered on the challenge of creating a welcoming environment for praising a loving God and taking security measures such as locking the front door was also expressed in separate in-depth interviews with more than 50 congregational officials. Even when they do take strict measures, church leaders worry about the impact on their congregations. Crimes against congregations, from the burning of black churches to hate-based defacement of mosques and synagogues to the massacre at a small Baptist church in Texas last year, have brought public attention to the vulnerability of houses of worship. But little attention or research has been devoted to how congregations are responding. Scheitle’s research, funded by the National Science Foundation, is helping fill that void. 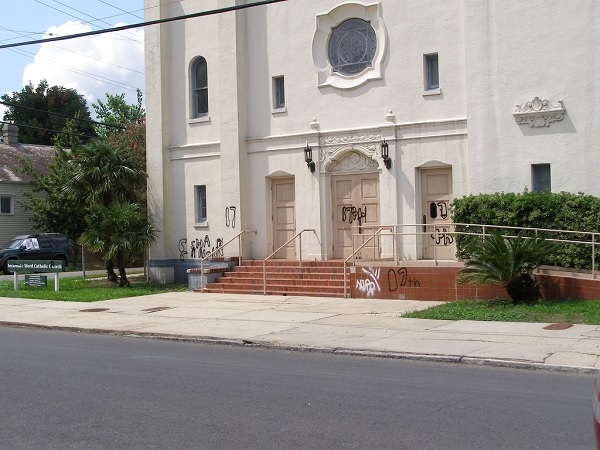 The most common crime reported was outside vandalism, experienced by nearly one in five congregations. Sixteen percent had property stolen inside their building, and 7 percent reported auto thefts. Two percent of the 1,380 congregations reported assaults in the past year, 1.4 percent reported a robbery-mugging and half a percent said there was a homicide at their congregation. But not all religious groups were targeted equally. Jewish and Muslim congregations reported a higher rate of receiving threats. Fourteen percent of synagogues and 18 percent of mosques reported receiving threatening letters, calls or e-mail, compared to 6 percent of the overall sample. Black Protestant congregations reported higher levels of auto theft and assault on their property. While less than 2 percent of Protestant churches feared being the victim of a bias crime in the next year, 16 percent of synagogues and 22 percent of mosques were very concerned about being the victim of a hate crime. Still, the nearly 40 percent figure of congregations experiencing a crime did not vary greatly across religious traditions. Out of 18 different security precautions measured in the survey, the most common, an alarm system, was only active in 43 percent of the congregations. “Our survey showed that the majority of congregations do not have much of any security measures in place,” Scheitle reported in the Review of Religious Research. There are practical reasons more congregations do not take greater security measures, Scheitle said. Many congregations are small, often with fewer than 100 members, and cannot afford elaborate security systems. And congregations, similar to businesses, would rather spend their funds on serving their constituents and fulfilling their mission than hiring armed guards. But money is not their only worry. Congregations are also not like a bank or a department store where guards and security cameras are common. “The whole idea of a place of worship is creating a spiritual environment, a sacred feeling,” Scheitle said in an interview. In the in-depth interviews, congregational officials told of facing difficult choices balancing faith and security, Scheitle and sociologist Jeffery Ulmer of Penn State reported in the Journal of Applied Security Research. • An Episcopal congregation reported it lost a couple of members in part because they were required to have a criminal background check to hold on to their keys to the building. • While some Christian churches announce their presence with roadside markers at the town line or prominent signs easily visible from the road, many mosques are finding it necessary to take down outside markers. “That’s how we protect ourselves, just a low profile,” one mosque official said. • A synagogue asks police officers providing security to be in a sweater or sport coat inside the sacred space of the sanctuary while people are praying, but to be in uniform when stationed outside the building as a deterrent. In the end, security concerns are a paradox for churches, one Catholic leader said.